Susana Mendoza was in grade school when her family left Chicago for the Bolingbrook-area. More than 30 years later, she’s back in the city fighting the violence that once forced her family out. It’s funny how life can sometimes can come around full-circle. In 1979, the Mendoza family moved from their Little Village inner-city Chicago neighborhood to the city’s suburbs in efforts to avoid gang violence and the devastating results that compromise the families involved. Now, more than 30 years later, the young daughter of that family—Susana Mendoza, a graduate and now Chicago City Clerk—has moved back to the city and is leading a charge against the same violence that drove her family away three decades ago. It was soccer that would give her the ability to build character that would not only help her succeed on the field, but in life. Over the course of the next three years, the family settled into a comfortable life, saving steadily towards the purchase a modest home in Bolingbrook. Bolingbrook would prove to play a pivotal role in the determination of the woman she would become. Here, she was exposed to a wide range of adults who continually modeled positive behaviors. Mendoza’s competitive spirit emerged and became interwoven into other areas of her life—the energy displayed on the field was channeled directly into the classroom, which translated into excellent grades. Mendoza entered her freshman year at Bolingbrook High School , which did not have a girls team, and was denied a spot on the boys team. Throughout her freshman year, she campaigned for a girls squad, an effort which was rewarded her sophomore year with the birth of the first Lady Raiders soccer team. Along the way she earned the respect and admiration of adults and peers alike. “There is nothing phony about Susana. She is one of my all time favorites,” says Larry Bernard, a retired Bolingbrook athletic director. “How she was in high school is how she is now. Her coach, Jim Paskiewicz, passed away but I know if he was alive, he would say the same things. Mendoza would go on to capture varsity soccer all-state and all-midwest honors. She also earned bragging rights as the first female and tenth person in BHS history to earn a coveted spot on the athletic wall of fame. The accolades continued to roll in as Mendoza attended Northeast Missouri State University (now Truman State University) on a soccer and academic scholarship, where she again snagged some hardware—this time all-Midwest honors in soccer. Mendoza graduated in 1994 with a bachelor’s degree in business administration and upon leaving college, packed up her belongings and headed back home with intentions to make a positive impact in the city her family fled years before—Chicago. Mendoza landed a job with Marriott in the hopes of building a portfolio that would help her to make a giant leap into a public relations position for a major advertising firm. Within weeks, Mendoza volunteered her communication services on a political campaign. Unhappy with the job her state representative was doing, Mendoza decided to delve into public service to champion long-term solutions. Mendoza’s first run for public office ended in a 55 vote loss. Down but not out, Mendoza pragmatically accessed her campaign strategy. Committed to run again, she announced her candidacy the next day. In 2000, at the age of 28, Mendoza was elected as the youngest member of the 92nd Illinois General Assembly. An unintentional maverick, Mendoza now understands the power of her presence. In 2008, Governor Blagojevich blamed Mendoza, along with nine other Chicago democrats, for lawmakers rejecting his capital bill. Not one to back down from a fight Mendoza responded. Other lawmakers came to her aid as well. Time and public record would prove Mendoza’s assessment of Blagojevich correct. She was a leading sponsor of HR 1650, which created the panel to impeach former Governor Blagojevich and served as an active alternate member of the impeachment committee. Regardless, Mendoza kept her nose to the grindstone, continuing to do the job she was elected for. 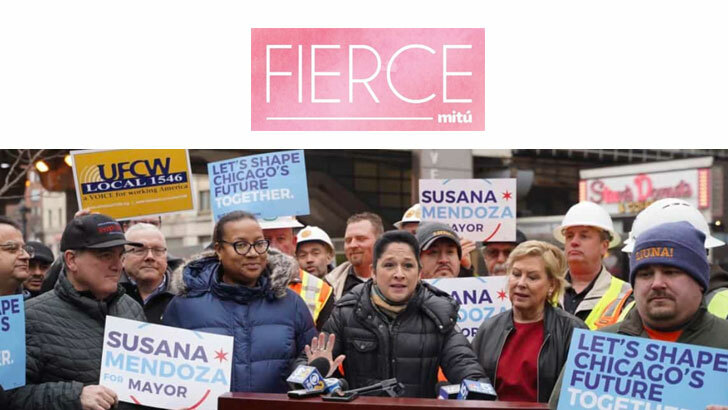 As an Illinois state representative, Mendoza has been publicly recognized for her leadership and legislation on social services, education, law enforcement and job creation. When Mayor Daley announced his retirement, Mendoza was embarking on her sixth term as a state lawmaker. Almost immediately Miguel Delvalle, who at the time was Chicago City Clerk, entered the mayoral race. Because he could not run for both seats, the city clerk position became open. Rising to the occasion, Mendoza and a host of volunteer supporters collected nearly 30,000 signatures. She later staged an effective campaign and won the election. On February 22 of this year, Mendoza was inaugurated as the first female City Clerk of Chicago. View the article: Greathouse, T. (2011, October, 20). Bolingbrook Grad Now First Female City Clerk of Chicago. Bolingbrook Patch. Retrieved from www.patch.com.